Our membership of the European Union (EU) is a subject that divides Britain. In late November, The Independent’s monthly poll on the matter suggested for the first time that more than half (52%) of British voters would opt to leave the EU in the coming referendum, though it’s hard to say how much of this shift is due to the recent terror attacks on Paris. Yet despite the apparently bitter split between the Ins and the Outs, there is consensus on the EU’s flaws. Both sides agree that the EU suffers a “democratic deficit” – it is unaccountable and distant from voters. They agree that it is reactive rather than proactive – you just need to look at the years of flailing around over Greece, and the chaos of the ongoing refugee crisis, to see that. And In or Out, many question the future of the European project and the EU’s drive for “ever closer union”. The key difference is that the Ins believe we should try to reform the EU from within, rather than take the risk of leaving. They predict that, if we left, trade would be disrupted, jobs lost and financial services damaged, and that we’d see a second Scottish referendum that could split the UK. The Outs see reform as impossible, and the risks of leaving as overstated – Brexit might cause some disruption, but any problems will soon be overcome and will pale by comparison to the potential benefits. In short, the status quo won’t do – we need to reach a new deal that gives us more autonomy and a greater say in our own future. If that’s achievable, perhaps there’s hope for the EU yet. But if the EU pushes back – as seems likely – then we shouldn’t be afraid to vote to leave. As an independent sovereign state, Britain will thrive, just as it did for centuries before the EU came along. Let’s be clear here. I like Europe. Europe, the continent, is fabulous – the food, the culture, the people. That won’t change. The EU, on the other hand, is a bureaucratic, undemocratic and centralised organisation. It has overstepped its mandate and is pulling Europeans in a direction that goes against their best interests. And that’s why we think Britain would be better off out. At the heart of the 28-member EU is the eurozone. Of the 19 states who share the common currency, only a few have grown stronger since the 2008 credit crisis. Many have seen their economies shrink. Debt levels have ballooned, and in many nations, youth unemployment is robbing a generation of its future. To repair the damage – which starts by getting rid of the debt – there needs to be growth, inflation or default. Yet, not one of those natural remedies is free to work its way through. Instead, the EU opts for delaying tactics while hoping for further integration. The Greek debt crisis erupted more than five years ago. If Greece was outside the eurozone, the crisis would already be over. It would have defaulted, devalued, or a mixture of both, and would be well on the way to recovery – indeed, without the reflected credibility of Germany’s credit rating, it likely couldn’t have racked up all that debt in the first place. Yet within the eurozone, it remains paralysed, lurching from crisis to crisis with no resolution. It’s not just Greece. Much of the north has grown richer while the less affluent south has been bled dry – and this appears structural (a product of the eurozone’s design) rather than cyclical (due to temporarily unfavourable economic conditions). In essence, the problem is that both the “deutschmark” and the “drachma” are significantly mispriced – that is, the euro is overly weak for Germany and the north, artificially boosting its economy, and it’s too strong for Greece, Portugal and the like. But since they share the currency, in order to readjust, the south must undergo a painful internal devaluation. The fundamental problem is that these economies are too divergent to be harnessed together like this, and the attempts to force them to be more similar are just highlighting the “clout” disparity between Germany and Greece, for example. It’s worth noting on this point that we’re far from alone in questioning our relationship with the EU. Finland’s parliament will debate its membership of the euro next year – since 2008, Finnish GDP has shrunk by 6% whereas Sweden’s has grown by 8%. Many blame the euro for harming Finland’s competitiveness. Like Britain, Sweden kept its currency. As a result, the krona (like sterling) fell during the credit crisis and stimulated the economy at a time of need. And yet the solution to these problems, as far as the EU is concerned, is deemed to be ever-closer union – a shared banking system, transfers between rich and poor regions, and arguably a more uniform culture, in terms of attitudes to paying taxes and behaving “responsibly”. The problem is that ever-closer union is exactly what we don’t want. Earlier this month [in November], Britain’s prime minister, David Cameron – best described as a right-wing In voter – wrote to Donald Tusk, the president of the European Council (and former Polish prime minister), with four demands. These included legal protection to prevent non-eurozone EU countries from being treated like second-class members of the club; the setting of goals to reduce red tape emanating from Europe; greater autonomy and a stronger voice for national parliaments in the EU; and more say over immigration and welfare. But, in Cameron’s words, “our concerns really boil down to one word: flexibility”. The Outs, of course, wanted much more. But as Mark Field MP put it, the letter represented the “art of the possible”, and Cameron hopes these demands will be enough to keep Britain at the heart of a reformed EU – but he also pointed out that life will go on whether we remain a member or not. So if both Ins and Outs agree that the EU is flawed, and that Britain needs more autonomy from Brussels, where do the differences lie? The Ins, both left and right-wing, see Britain as the bridge between Europe and the English-speaking world. The EU would be weaker without us, and the risks to us of leaving are too high, so why rock the boat? Britain should stay, and improve the EU from within. The Outs, on the other hand, come at the issue from the opposite ends of the political spectrum. The Outs on the right cite greater global trade, less regulation, and improved controls over immigration as benefits of leaving the EU, but they want to keep the free movement of capital, goods and labour. The Outs on the left see the EU as anti-socialist. They want the ability to nationalise or subsidise industries – for example, EU rules prevent Britain from bailing out its collapsing steel industry. But they like the social chapter and the working directives. But what both types of Out share in common is that they want our laws to be written in Britain, not Brussels. What might Brexit look like? Many cite Norway and Switzerland as models to follow. However, in reality, they are both special cases and Britain needs to find its own way. Switzerland is arguably the most democratic country in the world. Power is truly decentralised to the cantons and town halls. It would have been entirely unconstitutional for Switzerland to shift power to Brussels. The Swiss stayed on the fringes to protect their democracy. In this sense, Britain is nothing like Switzerland. As for Norway – the nation held a referendum on joining the European Economic Community in 1972 and 53.5% of voters said “no”. The Norwegian government dragged them into the European Economic Area regardless in 1994. That gives them 100% of the regulations and 0% of the say – hardly an enviably position. So Britain must find its own way. What might that involve? The biggest bone of contention is over trade. Germany’s Bertelsmann Foundation recently published a “worst-case” scenario for Brexit. If both trade and financial services were impacted, Britain’s GDP would shrink by 14%. While Brexit would be damaging for Europe, in this scenario, Britain suffers more. However, as you’d expect from a “worst-case”, it’s arguably overstated. Bear in mind that the UK has a trade deficit with Europe – that is, we buy more from them than they buy from us. Business for Britain (a right-wing Out group) has put together a detailed analysis of how a new trade deal with the EU could be pre-negotiated before any Brexit. The rest would quickly fall into place. Steve Baker MP, head of Conservatives for Britain, notes that Britain is already a member of the World Trade Organisation (WTO). Under these rules, Europe must offer us “most favoured nation” trading status. As a result, says Baker, “our membership of the WTO defrays even the worst-case scenario of trade barriers being erected under WTO rules if we left”. More broadly speaking, global trade tariffs have been falling under globalisation. Free trade benefits all involved, so it is in no one’s interests to reverse that. In any case, the EU promotes the trade in goods over services – it wasn’t built for Britain, a world leader in services. And overall, the EU is becoming less important in our overall trade mix. The Office for National Statistics states that the EU’s share of global GDP has fallen from 30% in 1993 to 24% in 2013. That reflects the growth of the emerging markets. Currently that’s slowing, but they are the future – the proportion of trade accounted for by the EU “has fallen consistently since 1999”, reports the ONS. In fact, as pro-Brexit MEP Daniel Hannan points out, “Britain is the only EU state that sells more outside the union than to other members”. What about the impact on business more generally? Business needs to be able to plan ahead – uncertainty impacts on investment plans – so it would be better for all concerned to get the referendum out of the way as quickly as possible. Beyond that, the EU is probably more of a concern for small firms. The multinationals already operate everywhere. Staying in the EU is probably less disruptive for them – they are big enough to cope with red tape, and if regulation makes life difficult for their smaller or less well-established rivals, then it is their friend. But ultimately In or Out makes little difference to them. For small businesses, it’s different. They would prefer less regulation generally, and this issue is about a lot more than just trade. According to Business for Britain, 80% of small firms polled would prefer regulation to be home grown, particularly when it comes to employment law, health and safety, and qualifications. Critically, only 5% of the respondents exported to the EU, yet all must adhere to 100% of the regulations. Another big player in the debate is Britain’s crucial finance industry. The City itself is split on our membership of the EU. And while the press tends to assume that they act out of self-interest, a vocal minority speaks from the heart. For example, talking to hedge-fund manager Crispin Odey (a right-wing Outer), he’s less concerned with the impact on his business one way or the other, than with a desire to see British democracy fully restored. Indeed, he told me that we need to re-think our constitution entirely, calling for an elected House of Lords. But as far as the risk to the City goes, Michael Petley, chief executive of investment manager ECU group, points out that the City was 100 years or more in the making and has huge competitive advantages over potential post-Brexit rivals. It has the formidable logistics needed to run a major financial centre. British law dominates financial contracts. There’s our time zone (convenient for both Asia and the US) and the fact that English is the language of business. London is a world leader in accounting, financial technology, regulatory matters, banking and capital markets. Petley reckons it would take 25 years to create a financial hub to replicate this. On top of that, London’s success has brought in hundreds of thousands of expatriates and their families from around the world. A major financial centre needs schools, housing, hotels and an airline hub. The population is 8.5 million, but it touches a multiple of that each day. London is more than a city, it is a network – and that is irreplaceable. Britain loves Europe. The proof lies in the success of easyJet as much as anything else. It’s a fantastic place and whether Britain stays or leaves the EU, that won’t change. The Outs are not anti-European, just anti-EU – they are two entirely different positions. Take Winston Churchill. Churchill was both a European and a capitalist. He wanted to see the free movement of goods, capital and labour, and believed that free trade would bind nations together and create a lasting peace. In this sense, Churchill was the founding father of the European dream. And while we can never know what he would make of today’s EU, we can imagine. As an economic liberal, he believed in light regulation and said of the post-war Labour government: “If you make 10,000 regulations you destroy all respect for the law.” We can only assume that the EU passed the 10,000 mark long ago. Excessive rules feed a bulging bureaucracy. 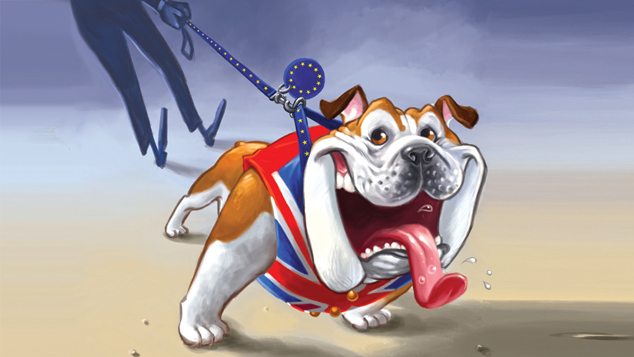 Perhaps we Britons take too much notice whereas others don’t – but robbing our own bureaucrats of a stream of new rules to gold-plate is just another reason to leave. In short, the problem is that while the EU may have been built on free-market ideals, it is a long way from achieving those ideals. The regulatory burden and the European parliament’s supremacy over national parliaments is unwelcome. But most importantly, by design or otherwise, the EU’s actions and structures drive its members towards a centralised social and political model, fed by high taxation. In turn, that means that power will always flow towards and serve the interests of the biggest, most influential partners in the EU – Germany and France. That attitude is holding back the rest of Europe, particularly those countries locked into the euro. That’s a great pity. But we don’t have to remain part of that. There is no doubt that Britain would thrive alone. We might have to endure some short-term upheaval, but in the longer run it’s better than remaining in an unreformed EU. The EU in its current form serves neither Britain nor Europe. It must undergo radical change. And if it can’t or won’t, then Britain should go it alone. Charlie Morris spent 17 years working in the City, and now edits the Atlas Pulse newsletter.